Well, we all know that’s not true, I’m witty and adorable and you love reading my nonsense. But yes, I’ve been super neglectful of this space for the past week, and I don’t have a great update to share now, no masterful articles masking identities behind confusing dating tales or anecdotes from the last time I drank too much wine (e.g. last night). I do have an excuse though – the new job, while already rewarding and fulfilling on a whole new level, definitely took me by surprise last week, in terms of hours in the office and the volume of work during the day. To clarify: this is a GREAT thing! But it does mean that I need to learn how to re-adjust my normal blogging schedule so I don’t fall so far behind again. It’s quite funny to think this is exactly what I was doing last year too, learning how to blog on a schedule, but I figured it out once before and I’m confident I’ll do it again. Atlantic City was AH-MAZING. The Nickname Posse definitely crushed it the whole weekend last weekend: gambled a little on Friday night, my lovely friend M and I did poolside yoga on Saturday, we managed to get six free appetizers at dinner on Saturday and then went to a Lil Jon almost-concert in a deliciously trashy club. The weekend ended at Five Guys before noon where we all ate with our sunglasses on and hoped that the two hour car ride wouldn’t be the end of anyone. Started the new job with a horrid migraine though, which was a great way to remember that I’m no longer 21 and going out two nights in a row is a recipe for disaster. Valentine’s Day is actually one of my favorite non-holidays, even (and almost especially) as a single person. This year I treated myself to a Core/Inversions workshop with one of my favorite yogis (NERD ALERT) and then went to Connecticut for a few days to celebrate mama B’s birthday and take care of a few doctor’s appointments. Because yes, I’m 26 and I still like my doctors from high school. Snowstorm Neptune or whatever it’s called wreaked havoc on Connecticut yesterday morning. There’s nothing quite like a good snowstorm at my parent’s house to bring me back to childhood, a big mug of hot chocolate after shoveling the driveway and throwing a few snowballs for good measure. Truth be told, I meant to catch up on blogging all day yesterday, but instead I sat with the aforementioned hot beverage and got sucked into a Twilight marathon on television. Judge away, IDGAF. I promise promise I’ll figure out the new blogging schedule soon. Especially since there are definitely a few funny stories from the little blips above – but all in good time. Cardinal rule: if you’re not sure, it’s pee. “I think I’m just going to wear my Uggs today, they’ve probably cleared the snow.” Nope. First, anything that isn’t waterproof is a poor decision. Never assume the streets are cleared because normally they’re not. And never, ever think that Uggs are an acceptable choice for a snowy day or the days after. They may be comfortable, but those little shoe-monsters are the WORST in the snow. They’re slippery, they’re terribly uncomfortable when they get wet after stepping through the unavoidable street puddle and they’re impossible to clean. It’s worth spending the money on Wellies or snow boots or basically anything that isn’t suede Australian fluffy boots (because all things considered, the Aussies really know about snow). 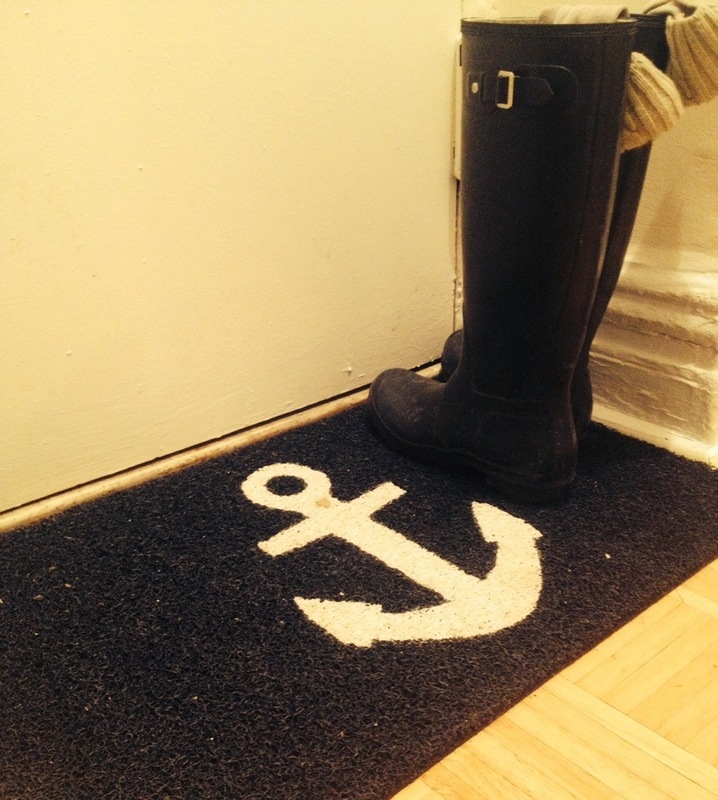 I am embarrassed to admit that it took me three years (plus) to get a doormat in my apartment. Before this past January, I just tracked that dirt and nastiness THROUGH MY BEDROOM to my shoe closet. Shudder. It took waking up one morning to find the cat licking a puddle that had formed around my rainboots to realize that something needed to change. One trip to Bed, Bath and Beyond and $20 later, I am the proud owner of a doormat that catches all of the nastiness of outside and keeps it contained. Life changing? Yes. Yes it is. Poor choice: not checking the weather. On average, I’m outside and walking for at least 45 minutes a day. The last time I skipped the glance at my weather app, New York had one of the biggest snowstorms of the season. Walking home from work in 10 inches of snow was a treat. I was in a lighter winter coat and Uggs, sans gloves or umbrella, and to top it all off, my entire block was un-shoveled until the next day. We all have smartphones now. Just check the weather. As we’re posed for even more snowstorms in the next week, I can almost guarantee I’ll do something to inspire a Part II on this. Until then, enjoy the snowstorm and don’t eat yellow snow. 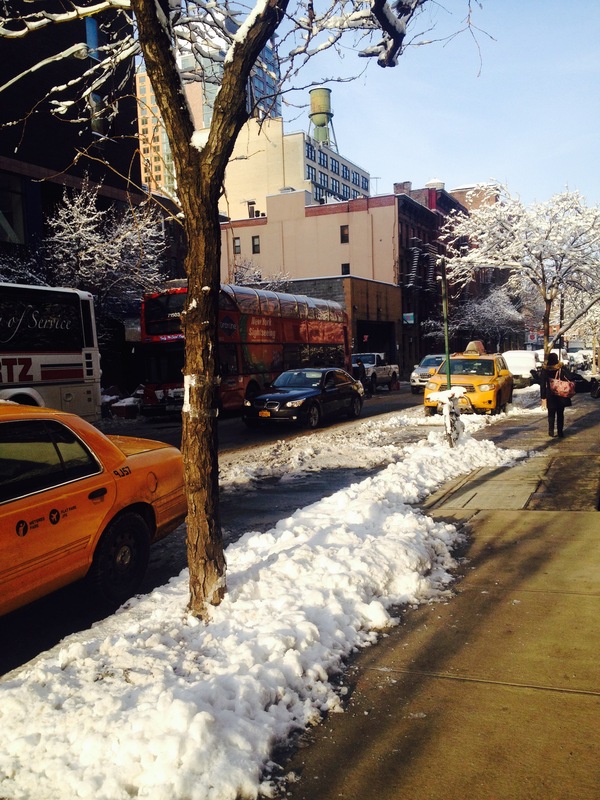 Or, if you’re a New Yorker, just don’t eat snow.